Spring rains have finally settled the dust on the streets; puddles lie everywhere. Grey skies and a slight chill in the air make me want to stay inside and make soup. Not something from a can with long list of ingredients, but slowly simmered, freshly cut mushroom soup, with plenty of onion and some diced shallot thrown in for good measure. 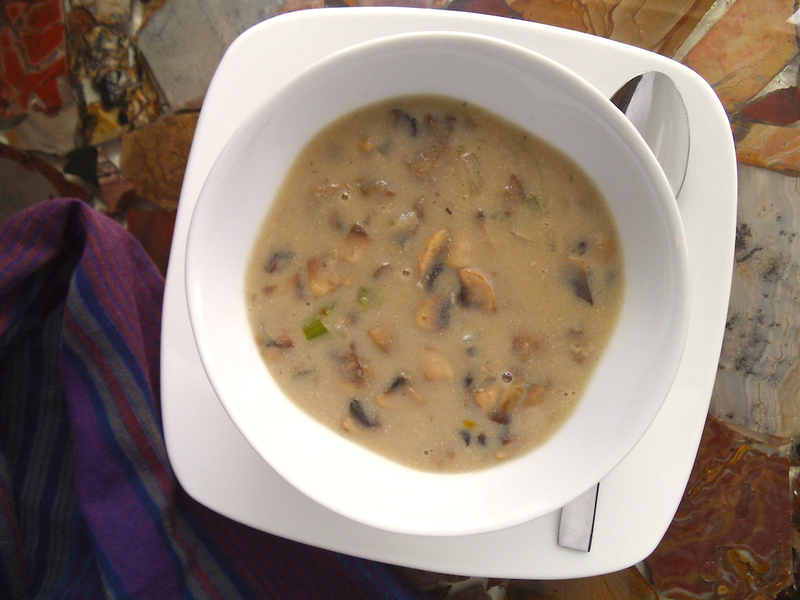 I’ve made fresh mushroom soup in two formats, both delicious. For the one, I blitzed the mushrooms into tiny bits, which gave the gave a thicker, richer mushroom flavour, but the texture was more like porridge. The other way is to dice the mushrooms by hand into small cubes. That’s what I’m showing you today. Up to this point, the impetus to make fresh mushroom soup came from not wanting to let delicious mushrooms get squishy. 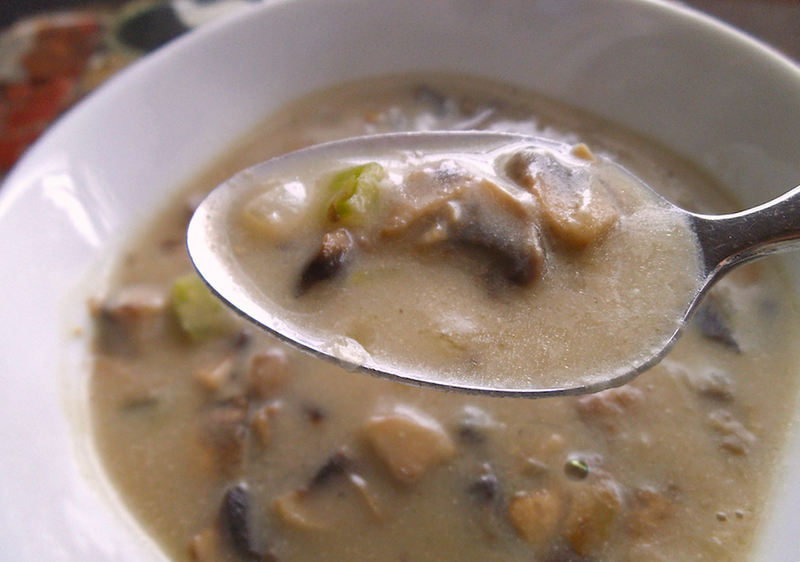 However, the next time I buy mushrooms might be expressly to make this creamy stick-to-your-ribs soup. In a medium skillet, heat butter and oil over medium heat. Add onions and shallots and saute for several minutes, until soft and fragrant. Add diced mushrooms and cook until soft, seasoning with garlic salt or sea salt. Stir in rice flour until evenly coated. Turn off heat. In a medium sauce pan, heat broth to a simmer and add celery. Stir in mushroom and onion mixture. Simmer for 10 minutes to let flavours blend. Stir in cashew milk and heat through. Add more salt to taste and a dash of soy sauce if desired. Serve warm. * Alternatively, mushrooms can be blitzed in a food processor to create small bits, which results in more mushroom flavour and a more porridge-like soup. **Unbleached all purpose flour may be used if a gluten free soup is not needed. I share recipes here, at Allergy Free Wednesdays and at Gluten Free Wednesdays. This is the second time I’ve made this delicious recipe in a week. Shiitake – money’s mushrooms and wild hand picked pines.